Sorry if this has been posted before? So.. already had my black CLA for 2 months now. Time flies!! Any previous "black" car owners have any advice on best way to wash your car? First time I brought it through the automatic car wash. Washed ok but felt like it was taking a beating with those wipers After a few weeks of ownership I was looking closely at my car and notice some very very light streaks/scratches. I wondered if it was from the car wash? Then after I had my windows tinted someone there told me black cars can get scratched if there is the slightest dirt on you car and you wipe it down Which made me think. Whenever it rained I used to wipe it down with a dry cloth. Do you think this did the scratches? I've taken a peek at other black cars and have notice the same thing. Very very light scratches. Is this something I have to live with? I mean.. it's not noticeable unless you put your eye close and look for them. Any recommendations? Never wipe your car dry or with just water on it. The tiny dirt particles will scratch the paint (or clear coat). You have to use good carwash liquid and water and make sure they get nice and sudsy. It's the suds that lift up the dirt away from the paint. Once the dirt is lifted off the surface of the paint then rinse it off with water. There are videos on youtube on the proper way of washing a car. 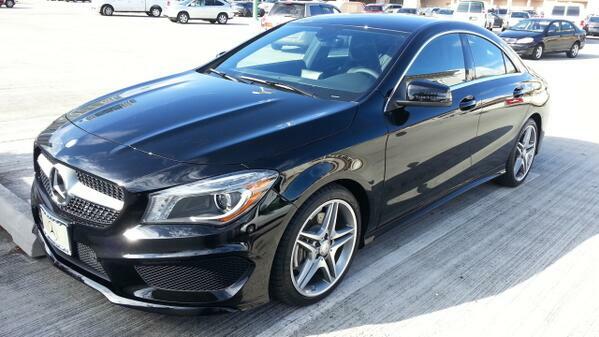 BTW, I had my black CLA tinted too. How dark did you go? Last edited by Tonyride; 01-07-2014 at 08:04 AM. Thanks for the reply. And the advice. I guess there's no in between. Either leave it unwashed... or give it a good wash Any recommendations on a liquid brand? Also, what do you think about those drive thru car wash places? I went as dark as I could go legally on the tint. However, don't remember what percentage that is.. think 25%? We have a drive through car wash near me but it's all hand washing. First they spray your car down with what appears to be just water. When the car enters the carwash it gets sprayed with suds. When the car is all covered with suds, there are guys in there doing the actual washing with these special mitts and towels stuff as the car moves along the track. So it's a drive thru car wash but is hand washed. I got mine tinted 50%/35% Front and Rear. Rusty Shackleford, flipstylephoto, BenzNewbie and 3 others like this. Yeah... I should have thought twice. I've always used them and they done a fine job. But I've never had a black car before and starting to realize it's limitations when it comes to this. It doesn't really bother me cuz unless your eyes are inches away and looking for scratches you'll never know. May I ask what do you mean by "corrected"? And also what do you think of mercedes benz dealership doing the car wash? Last edited by BenzNewbie; 01-08-2014 at 01:41 AM. Depends on how good your mercedes dealership is. from most of the reviews I've seen... I would say no.. Just wash it yourself. And tell them to not wash your car when you service it as well. My MB dealer always washes your car after a visit. They even washed my car when I went back to pick up the new license plates. They put them on the car and then hand washed it. I see. The reason why I asked is not that I'm too lazy to wash my own car. Just where I park my car is not the best location to wash my car. Then time is my next excuse. I guess I'll just have to buckle down and pick a day. My problem with trying to wash my car this time of year is the temperature. Yesterday the temperature reached a high of 11 F. This morning on my drive to work it was 9 degree and expected to reach a high of 24. Not too favorible for me.